If you are in the under-40 crowd and looking for something different to do this Friday, you may want to check out the Factory Society’s after-hours holiday wine tasting evening. 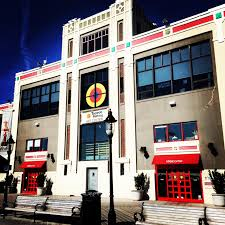 The Factory Society is the official young-professionals group of the Torpedo Factory Art Center (105 North Union Street). At this event, you will have the opportunity to meet local artists in their studios and discuss their artwork. Along the tour of the studios you will be served wines and light desserts. The evening is intended to give attendees a chance to learn more about the art they are enjoying directly from the artists themselves. You may even pick up a one-of-a-kind gift for someone special in your life. Participating artists include: Stephanie Booth, Matthew Harwood, Rachel Kerwin, Greg Knott, Alison Sigethy, Whitney Staiger, and Jennifer Brewer Stone. The Torpedo Factory Artists’ Association will also be giving an exclusive first look at original works of art in the holiday pop-up art shop. Another chance to purchase a thoughtful, original holiday gift. Tickets are $30 and are available here. You must 21+ to attend. Happy Holidays!